Two hours and and nine (9) euros were all it took to get us from Amsterdam to Brussels. We booked a room through Airbnb in the outskirts of the city and bought a city card for ease of travel. Since we arrived quite early, the train station where the bus dropped us was somewhat empty save for some tourist like us. We needed to buy tickets for us to rid ethe train but there were only ticket machines available. The machines didn't recognize our credit cards and we don't have loose change to purchase single journey tickets to get us to the main station. Ticket booths are still closed and I was becoming agitated. A local stranger noticed our distress and approached us. I was a bit wary as the Brussels attack was still so fresh, happening a little over a month ago. I hesitated as he approached us but he gave us train tickets. I wasn't so sure but what the heck, I needed to get on that train. Lesson of this short story: Prepare coins for commuting. You will never know when you'll need it. 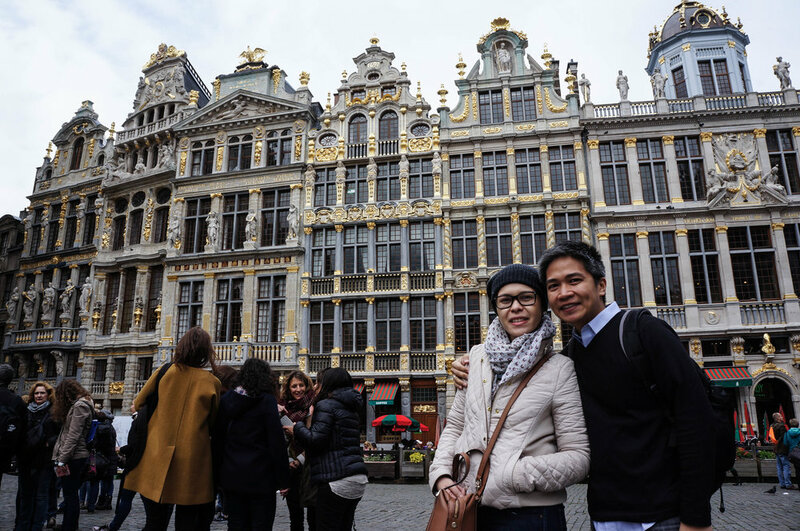 Brussels will be our base as we plan to explore nearby the nearby cities of Bruges and Gent. We got to Brussels fairly early and we were able to drop our bags in our room before heading out to our walking tour. We had a quick lunch, which was a pleasant deviation from our meat diet, at Exki. This soon became our favorite place to eat for quick, affordable, healthy, and organic meals. This might not be the cheapest option, but I feel it's really value for money. This is a relief from all the meat and fried food we have been eating as we toured around Europe. Right after lunch, we headed on to Grand Place a.k.a. Grote Markt for our walking tour. We almost always go with Sandeman's Free Walking Tour when our itinerary permits. As per our experience, Sandeman is reliable and organized. While it's not really "free" as you give a tip, we like their tours better as the guides as quirky, fun and funny, and interesting. You give what you feel the tour was worth so there's no "I've been ripped off" feeling. Generally, if we enjoy the tour, we tip the average of what we would pay for if we joined a paid tour or a little or more. Our guide Berber, holds a law degree, but decided she's rather tell stories for a living. She is a walking encyclopedia and and full of animation when she tells stories. We really had fun with her. The city center is quite compact and the sites close to each other, so one day is manageable to see the sights. During the walking tour, we took note of the areas we wanted more time in and went back later in the day. The most famous Mannequin Pis is underwhelming. Food! Of course, visiting a city won't be complete without trying the local delicacies. First on my list is Belgian hot chocolate while Jaysen's must try is the local beer. I must say the this hot chocolate is the most delectable I've ever tasted. Quite different from Paris' Angelina as that one is thick, maybe a little too thick. While delicious, I could only finish a cup with tiny sips. This one is really a drink I could finish and order another one. The hot chocolate is served in a mug with hot milk and a thick drop of chocolate bar is dropped. The anticipation builds up as I watch the chocolate melt and ribbon in with the hot milk. Heaven on a cold day. :) Jaysen judges a city by its beer or wine. He had a Maes and I have little to say on the matter. 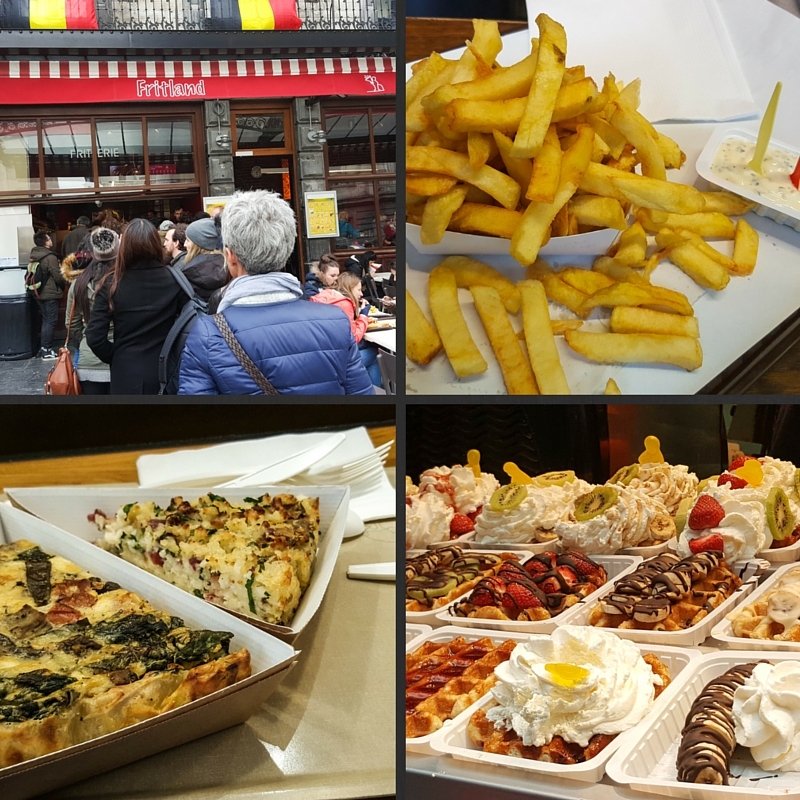 :) What is being Belgium without trying the famous Belgian waffles? The waffles are ubiquitous here. You can have one anywhere for about one euro. Locals say the "authentic" waffle is the one with not much toppings. But because we wanted to enjoy our waffles a little bit more and people watch, we had our waffles in one of the shops which tend to charge more than the ones you can buy off the street. Again, budget is relative. While it's good to know your numbers, it is important to strike a balance. Don't let the numbers ruin your experience. there is always room to adjust as you go along.